I could live without most makeup, but mascara is a product I cannot live without. Mascara makes a significant difference to my whole beauty routine, because it really helps open up my eyes to make them look wider, brighter, and more awake. I love the mascara magic! 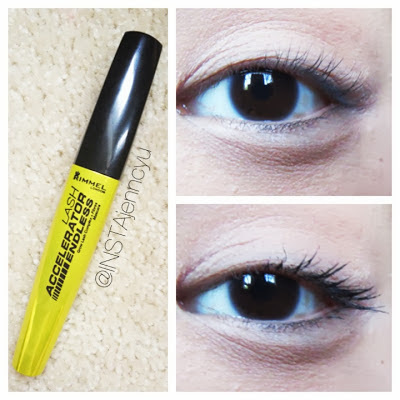 So naturally, I was really excited to try this new Rimmel mascara that Influenster sent me. I filmed a quick review and demo if you guys want to check it out, otherwise, the rest of this blog post will go over my thoughts on this new product. NEW LASH ACCELERATOR ENDLESS MASCARA stretches your lashes beyond the limits for instantly longer and remarkably stronger lashes! With the Grow-Lash Complex of Procapil®, Keratin and Antioxidants, lashes are conditioned day after day. After 30 days, lashes appear longer, stronger and more numerous! The lash-catching brush gives you perfect separation for a clump-free result and the new micro-fibre formula allows lashes to stay flexible, never stiff or brittle. Hitting the shelves July 2013! Will be available in stores that carry Rimmel products. QUICK TAKE: I loved the electric yellow-green packaging. I also thought the design was standard, but pretty ergonomic. USAGE TIPS: If this formula makes your lashes droop, then use it over a mascara that holds your curl better. For example, I apply Covergirl's Lash Blast mascara first and then wiggle Rimmel's mascara at the base of my lashes to thicken and darken them. THE VERDICT: I usually buy waterproof mascaras, because waterproof formulations hold the curl of my lashes much better, but I actually liked this non-waterproof mascara. It doesn't hold the curl as well as I would like, but it doesn't totally ruin the curl. The formula is really rich and smooth and doesn't flake at all. The brush is really sturdy and grabs on firmly to coat each lash evenly.